The explanation of the title of this exuberant adventure comes about three-fourths of the way into the book, and is so original and droll—well, and so outlandish—that when I came to it I laughed out loud. By that point, our hero, Jack Dashing, has been in, oh, a half-dozen fights, several chases, a couple rescues, and put a roomful of pompous asses in their place…always acquitting himself honorably and well. 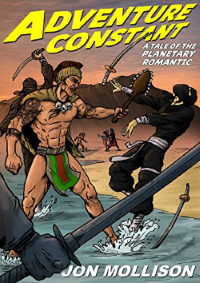 Thus begins Justin Tarquin’s review of my latest novel, Adventure Constant. It’s no surprise Justin enjoyed this book – he’s one of the people for whom I wrote it. Perhaps not specifically by name, but definitely by association. Justin has been an active part of the #PulpRev bad kids table for a long time and clearly knows his pulp style fun. As one of the dozens of likeminded readers and writers, his insights into fiction have played a role in my approach to the same. His approval carries a lot of weight in my book. It means that my work succeeded in all the right ways. But this book is more about action and adventure and the panoramic setting of Mollison’s parallel Earth: a globe divided into the Red Collective, the Shogunate of the Red Dawn, the Machine Empire of Europe, the Allied States, the Hashishim Moonies, and undoubtedly more not yet mentioned (hopefully there will be sequels). The world’s history resembles our own just enough to be vaguely familiar, but as if it had been conceived by a Martian counterpart of Edgar Rice Burroughs creating a setting for tales of exotic derring-do on the Blue Planet. That’s a great way to put it – and not just because he compares me to a Martian counterpart to the greatest science-fiction author in history. The reason the world of Jack Dashing works the way it does is tied directly to the first quoted paragraph, and it will make you laugh out loud, too.